I had seen a suggested day trip to Vienna from Bratislava on Tripadvisor but discovered the night before our journey, that the train station it suggested you arrive at, in Vienna, no longer exists!! So instead we made some slight changes and caught the 8.43 train from Hlavne Stancia (Main Rail Station) to Wien Hauptbahnhof Hpf (Vienna) €14 return. The journey takes about an hour and you pass mile upon mile of farmland and fields. We had our ticket checked by a Slovakian conductor and when we entered Austria we then had it checked by an Austrian conductor. Having understood nothing that people had been saying to us for a few days it was refreshing to then hear some German which I have limited but some knowledge of. At Wien Hpf we bought a Shoppers underground railcard, €6.10, that is active from 8am-8pm. Don’t forget to validate your ticket before you board the first train, after that you don’t need to do anything but make sure you have it on you. From Hpf we took the underground to Schönbrunn to see Schönbrunn Palace. The Palace is opposite the underground station which is great and was easy enough to find, this is not a small palace! There are a number of different ticketing options and we opted for the Imperial Tour €12.90. You are given a time slot for your visit, ours was 2 hours ahead, so we had apple strudel and a hot drink in the garden and then wandered around the Christmas market. The time soon went by and we didn’t even get as far as looking at the gardens. We paid 50c each to go to the toilet and when we got back to the hotel found we had been given a voucher for a free visit (it must have come with our food!) Ah well! I would recommend you go inside the palace a bit before your time slot so you can drop off any big bags and join the queue. After the tour we headed to Herrengasse station on the underground and were lucky to book the last 2 slots on the 5pm English language tour at the Spanische Hofreitschule (Spanish Riding School). This meant we had a few hours to tour the shops and we bought a late lunch at Nordsee which sells nice salmon with wild rice, potatoes or vegetables, among other seafood and fish options. The shopping streets of Vienna are so pretty. The Spanish horses and riders have Monday’s off, but on the tour you can see the horses in their stables. The other days they have morning practice sessions you can watch but I imagine you need to book well in advance. After the tour of the Stables we headed to Philharmonikerstrasse (which was quite a challenge to find). Here you will find the Hotel Sacher which has Cafe Mozart attached. Considering it is quite famous we were seated almost immediately, but it was very busy. I did try the Sachertorte (chocolate & apricot jam cake) which to be honest I found a bit dry and heavy (it was also lacking the mirror glaze I thought it was famous for). Their other cakes looked delicious, but felt I should give it a go. We then walked to Stephansdom (St. Stephen’s Cathedral) and could just make out the spire in the fog. There are lots of people trying to get you to see a concert, but we just didn’t have time. It was then time for is to head back to Hpf station and catch the train to Bratislava. Our train on the way back was an old fashioned one, with a corridor against one window and lots of little cabins that seated 6. No-one checked our ticket for Austria or Slovakia which was weird. Considering how much cheaper it is to fly to and stay in Bratislava, this is a much cheaper way of seeing Vienna. 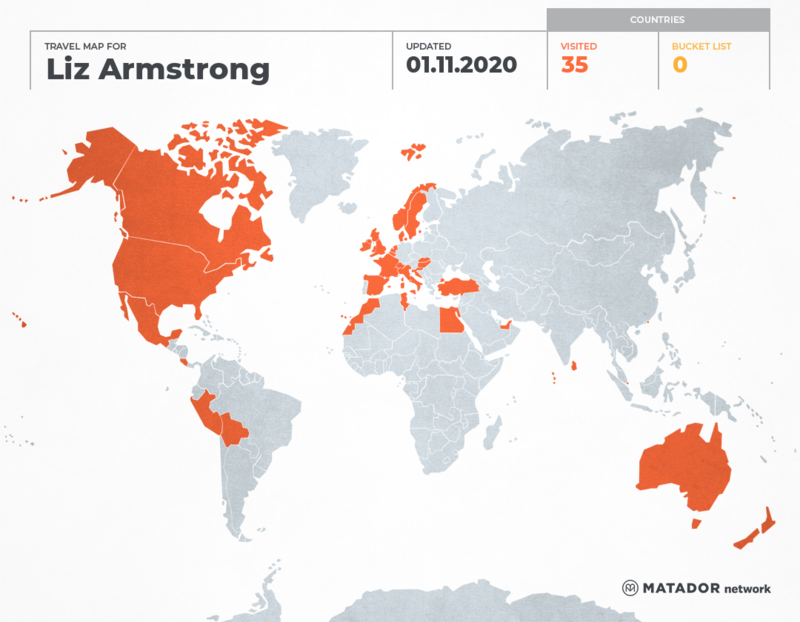 Liz Armstrong has been to: United Arab Emirates, Australia, Belgium, Bolivia, Canada, Switzerland, Costa Rica, Denmark, Egypt, Spain, France, United Kingdom, Hong Kong, Croatia, Hungary, Ireland, Italy, Sri Lanka, Morocco, Maldives, Mexico, Netherlands, Norway, New Zealand, Peru, Sweden, Singapore, Slovakia, Tunisia, Turkey, United States, Vatican. Budget: £250 including flights, parking, 2 nights at Airbnb, food, entertainment and souvenirs. I had booked my parking at Liverpool airport through Holiday Extras which gets you a discount but it still cost more than my bargain Ryanair £19.98 return flight from Liverpool! I landed in Dublin at 9.25am and caught the 700 Aircoach bus to Dublin. My first planned stop was to the Tourist office opposite Trinity College. They look after luggage for €5 for the day and are open until 10pm. I also bought a CitySightseeing 48 hour bus ticket from here. A quick wander around Trinity College grounds. You can queue and pay to go into the library to see the Book of Kells, but I wasn’t interested enough. I hopped on the bus and jumped off at the Guinness Storehouse. I spent a couple of hours in there, had some very nice Guinness bread with smoked salmon and cream cheese for lunch. The main entrance hall is in the shape of a Guinness pint glass! Each floor has a different theme and on one you get to try some Guinness…this was my first try of it and everyone told me Guinness in Dublin is better than anywhere else. I had a small mouthful and swilled it around before swallowing and yuck, not my thing at all. Back on the bus and did a full circuit around the red route. I then jumped off at Kilmainham Gaol (jail), which Tripadvisor currently lists as the number one thing to do. It was very interesting and the tour guide told us of all the history of the jail and the political prisoners, the executions and the movies filmed there including Name of the Father and Michael Collins, as well as an episode of The Tudors. I had a very nice fruit scone in their tea room. I then caught the last tour bus back to stop one to collect my bag. I had an OK Thai meal at the Thai Orchid first. I then went to the Airbnb apartment I was staying at. Tesco was nearby so I stocked up on fruit and yogurt for breakfasts. It was great to have a fridge in the room (and a silent one). Back on the bus and jumped off at the stop before you get to the Park. I popped to Subway, which was inside a Londis store and bought a sandwich, drink and cookies to have as a picnic in Dublin Zoo. As I am a member of RZSS they have a reciprocal arrangement for free entry, so that saved some money. I wandered around for about 3 hours I think. The gorillas looked very cold, sad and fed up. The orangutan enclosure wasn’t open which was a shame as I love them. When I hopped back on the bus it was the same driver who’d dropped me off and he commented on how long I had been in there and asked if I enjoyed it. All the bus guides give you slightly different presentation styles and humour. They are all very friendly and very helpful and so I would definitely recommend them. Their buses are red and there are two different tour bus firms operating in different colours (green and yellow buses). I then had a wander around the Temple Bar area and spotted the cinema times. At about 4pm I went back to the apartment for a wee lie down and rest whilst I waited for film time to start. Dublin has loads of cinemas and the ticket price is really reasonable. I went to The Savoy cinema on O’Connell Street to see Steve Jobs movie. The popcorn was very salty and they didn’t have a sweet version to mix with it. The seats were really comfortable though and there weren’t endless trailers before the movie. Back on the bus and I jumped off at the stop for Christ Church and Dublinia. Dublinia’s ground floor is all about Vikings and their part in creating Dublin and their history, the floor above was about Medieval Dublin, including a scale model of Dublin which is worth staying and watching through the whole electronic talk that lights up various parts of the model when explaining its history. I had late brunch at Copper Street Bistro and then walked down to Dublin Castle for a walk around the grounds. Next stop was more wandering around and around the centre of Dublin, around Temple Bar, around the shopping areas. When my feet were finally ready to pack up I jumped back on a bus and came to the Collins Barracks (now the National Museumof Ireland) to sit in the warmth of their cafe and chill out with a cup of tea and cake. It was then time to walk back to pick up my case and catch the bus back to the airport. I haven’t listed all the meals and snacks I bought here but my Total spend came to £263, but that did include a Christmas present for Allistar which is why I went over budget! I could have gone with a cheaper room without a private bathroom but I still thought the room was great value. We were quite late waking up and so headed for breakfast with only 30 mins left before they were due to stop serving. I was a complete piggy eating 6 pancakes with fruit…or at least I thought I was a piggy until Allistar beat me in that by having two waffles with maple syrup, strawberries, whipped cream with berries and because that wasn’t quite sweet enough he asked for icing sugar as well!! (Photo inserted below in Aquarium montage.) Our piling on the pounds day just continued all day, ending with a Cold Stone Creamery Love It sized ice cream! Now lying in bed having had a peppermint tea and still feeling like I may well explode. Anyway, apart from eating we did manage to squeeze in some tourist stuff. Firstly we hopped in a cab from the hotel to Dubai Mall. We headed straight to the At The Top Burj Khalifa and headed up at 12pm. We hadn’t pre booked for the lower floor (124), so the only choice you have is to buy the VIP ticket which takes you to the higher floor (148) anyway. We went back in the evening to see the fountain display and see it lit close up. After our trip to the top of the Burj Khalifa, we stopped at the food court which is closed off and hidden from the view of Muslims who are fasting for Ramadan. Then we had a look around the aquarium which was great value we thought. Especially in comparison to Blue Planet Aquarium that I used to work at. We travelled from Glasgow to Dubai overnight, arriving at the Raffles Hotel at about 8am, luckily our Room was ready. We had a wander around Wafi Mall, a game of glow in the dark mini golf, a snooze back in the room, afternoon tea in the Club Room, a swim in the pool, soup and canapés back in the Club Room, another wander round the Mall, bought a yummy ice cream and then crashed out in the sauna which is our balcony to upload these photos. We will venture out tomorrow but this was intentionally a lazy day. Persuading Allistar that Washington and Oregon would be a great roadtrip location really came down to the selling point that Portland has soooo many micro breweries and despite us only staying in Portland a couple of nights, he seemed to really enjoy the tasting trays that the brewery pubs sold. A small selection of the ones we visited are in the collage, plus a few city shots and my ginger ale. I really liked Portland, I could easily have stayed longer and hope that one day I will get an opportunity to return here. The streets were so clean, lovely architecture, a real buzz about the place…probably down to all the beer people consume. I did a Facebook quiz ages ago which asked which City I should live in and it came out as Portland. I know these quizzes aren’t scientific and are just a bit of fun, but I was disappointed that it hadn’t come out saying San Francisco!! I do love San Francisco so much, but Portland comes a close second above New York and Chicago for US cities I like.